This evening I made "Spaghetti w/ Mozzarella Stuffed Meatballs". I used my Spirelli to make the zucchini pasta and set it aside to quickly saute in a little olive oil right before serving. I then made herb and Parmesan filled meatballs using ground round and stuffed them with a chunk of fresh mozzarella cheese. 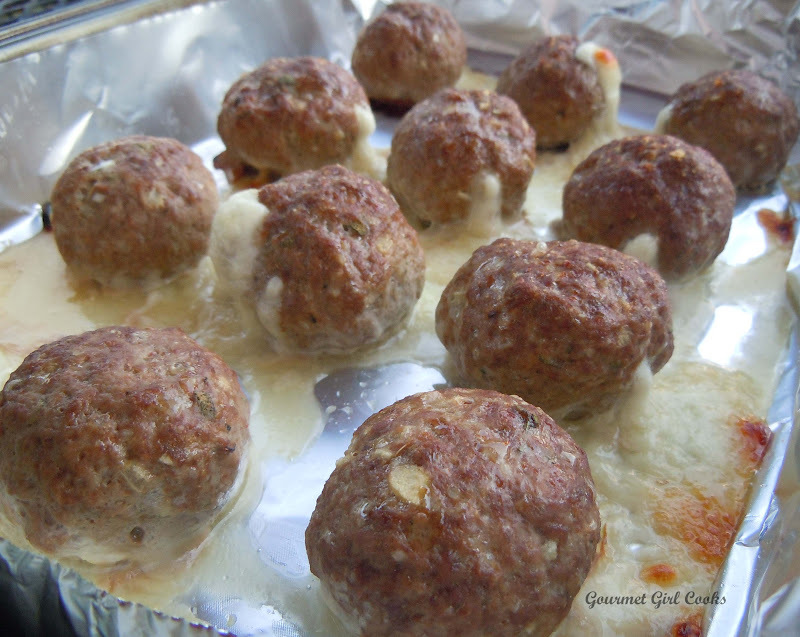 I baked the meatballs at 375 degrees for about 30 minutes and then placed them in a pot of marinara sauce (either homemade or your favorite jarred) and simmered them for another 20-30 minutes or so to let everything mingle. 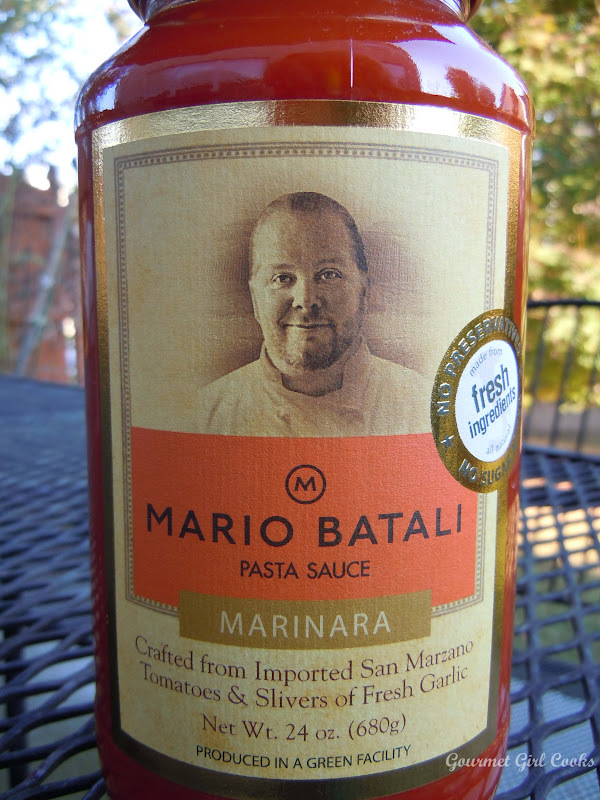 I used a jar of Mario Batali Marinara Sauce tonight to help make dinner a bit quicker to put together (his sauces use fresh ingredients without any preservatives and no added sugar). With the cooler weather coming, I sometimes like to make a big batch of homemade marinara sauce on the weekends and freeze it so I can pull it out when I want to use it during the week. There are plenty of good sauces without added sugar and preservatives on the market, although some of them are a bit pricey. I believe Mario Batali's sauces run about $7-8.00 per jar, but you can find them on sale for about $5.00 too, which is when I stock up on them. 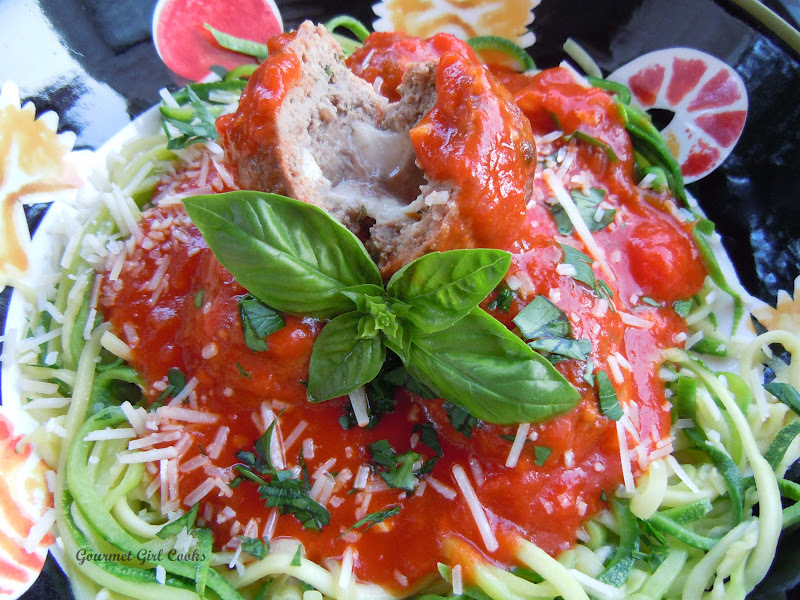 I served the meatballs and sauce on top of the zucchini spaghetti topped with shredded Parmigiano Reggiano, fresh Italian parsley and basil. Check out a few pics below. Enjoy! Preheat oven to 375 F. Mix all ingredients together in a bowl (except mozzarella cubes) until well blended. 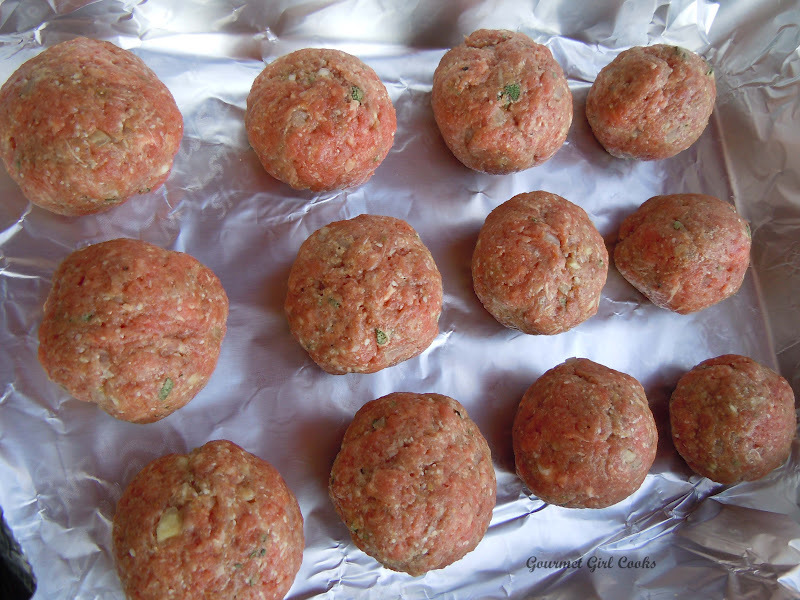 Divide mixture into approximately 12 evenly sized sections to make 1 dozen meatballs (you can make them larger if you prefer). Roll each of the sections into a ball with your hands (approximately golf ball sized). 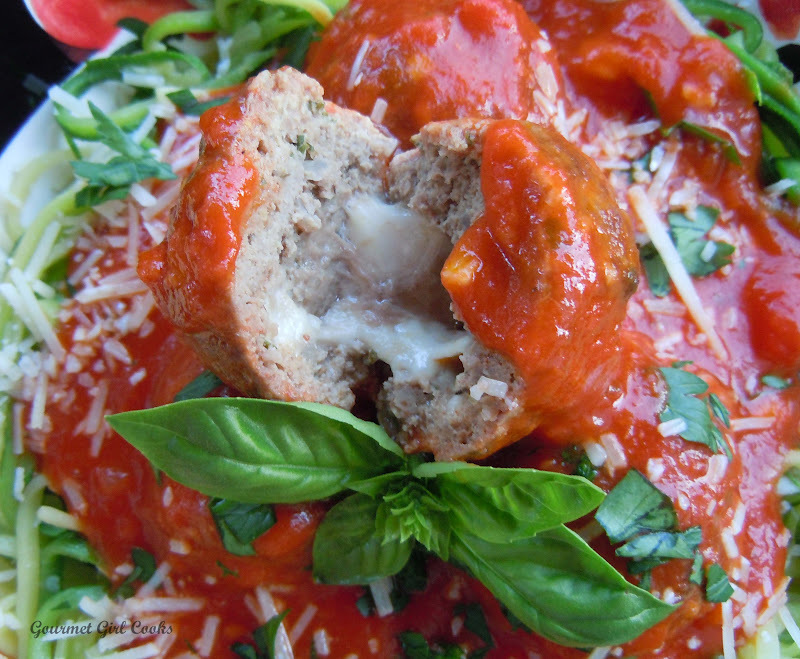 Press a cube of mozzarella into the center of each meatball and seal well. Place on a foil lined pan and bake about 30 minutes at 375 degrees. 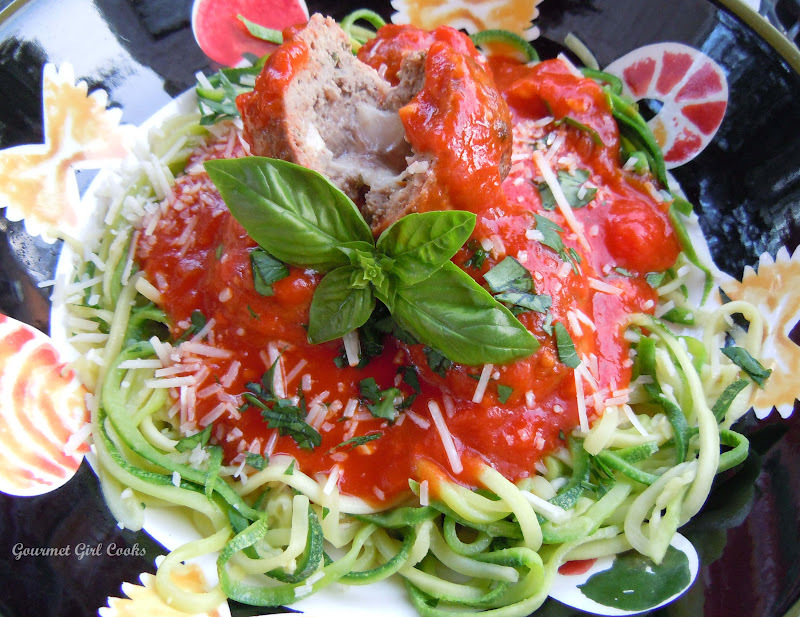 When done baking, place in a pot of marinara sauce; cover and let simmer about 20-30 minutes. Serve over the pasta of your choice.